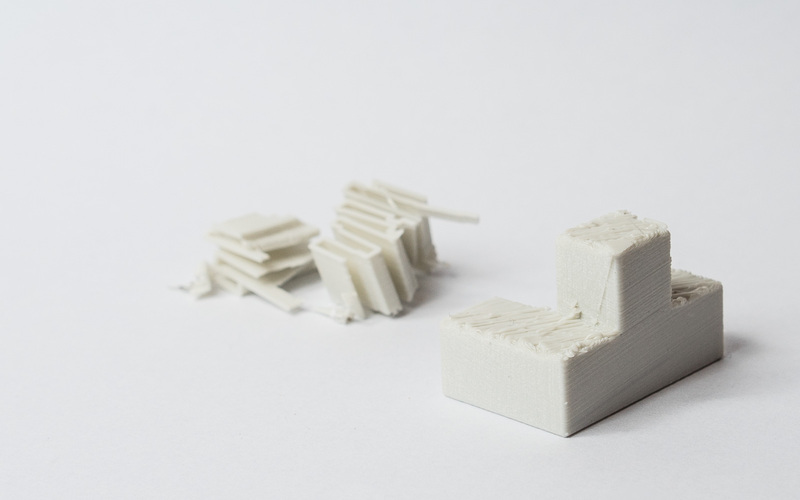 Learn what a 3D printed support structure is, when support is needed and how support might affect the quality and price of your print. As 3D printed parts are built layer by layer, a previous layer to build upon is required. Depending on the specific 3D Printing technology and the complexity of the 3D model, this can mean that a 3D print requires support structures. When considering what technology to print a 3D model with, it is important to consider support structures and how they may affect the final result. Support structures will have an impact on surface finish as they require post-processing work to remove, resulting in blemishes or surface roughness. This article discusses supports, how supports are implemented for each 3D printing technology, and how the use of supports can impact the design decision making process. Fused Deposition Modeling (FDM) extrudes a melted filament onto a build surface along a predetermined path. As the material is extruded, it cools, forming a solid surface providing the foundation for the next layer of material to be built upon. This is repeated layer by layer until the object is completed. When is support needed in FDM? With FDM printing, each layer is printed as a set of heated filament threads which adhere to the threads below and around it. Each thread is printed slightly offset from its previous layer. This allows a model to be built up to angles of 45°, allowing prints to expand beyond its previous layer’s width. When a feature is printed with an overhang beyond 45°, it can sag and requires support material beneath it to hold it up. More information on overhangs and FDM can be found here. Hot material can be stretched short distances between two points in a method known as bridging. 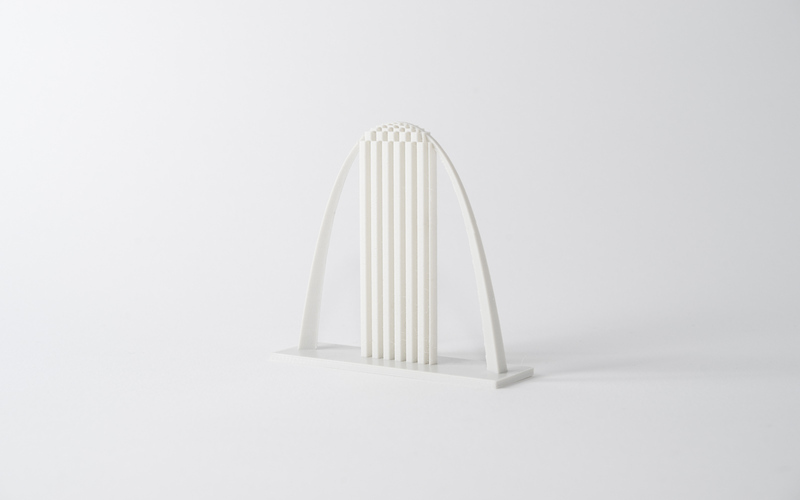 Bridging allows material to be printed without support and with minimal sag. If a bridge is over 5 mm long, generally, support is required to give an accurate surface finish. More information on bridging and FDM can be found here. 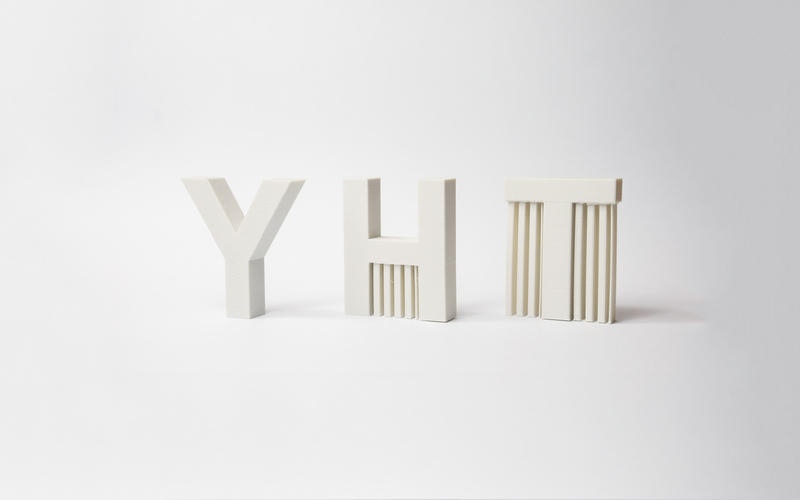 Consider the letters Y, H, and T, and a set of associated 3D models. The arms of a model of the letter Y can be printed easily. Even though the arms the of Y are outstretched, because they extend at 45 degrees or less, they do not require support. The letter H is a little more complicated but if the center bridge is under 5mm, it can be printed without support or any sagging. Over 5mm and support will be required. For this example, the center bridge is over 5mm and support is needed. The letter T requires support for the arms of the letter. There is nothing for the outer arms to be printed on and the material will just fall down without support. The image below illustrates YHT with the support material shown in light gray. A visual illustration of support structures needed for printing a Y, H & T with FDM. Here is how the YHTs look when printed. The image below now shows the result of the T printed without support. The surface has significant sagging and will require a large amount of post-processing to clean up. 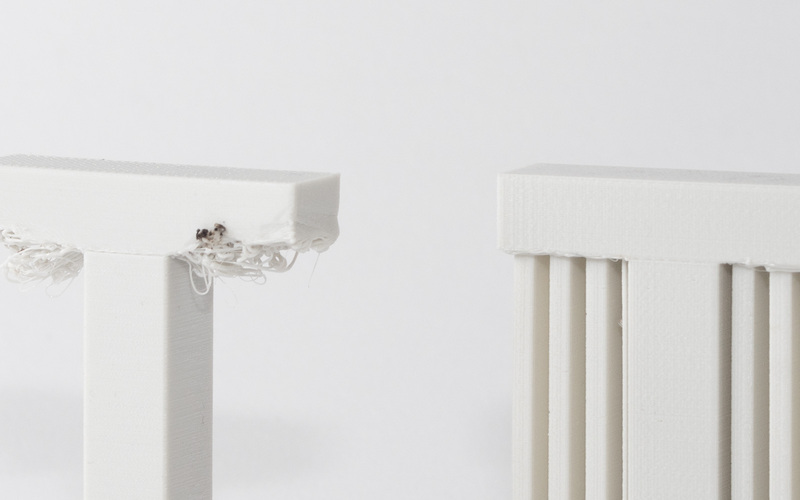 One of the limitations of using support in FDM printing is that post-processing is always required, resulting in marks or damage to the surface in contact with the support. Another issue is that layers printed upon support will be less perfect as the support will be slightly less stationary than the solid layers. Support can also be difficult to remove from small, intricate features without breaking the model. Furthermore, support requires additional printing material and therefore incurs additional costs. The support also needs removal, creating more work for the 3D printing service provider which can also increase the total cost of the print job. Puzzle piece with support removed showing surface roughness. How much support is needed for my FDM print? The arch example below requires only a limited amount of support placed in the correct location to allow it to be printed accurately. The St. Louis Gateway Arch shows the perfect example of using support with an arch shaped object. The “Ball in a Cube” shown below is an example that requires a large amount of support. Removal of the support in this example is complex and involves removing each support element with needle-nose pliers while attempting to limit the damage to the surfaces surrounding the support. Sanding or smoothing the surface after removal of the support is also very difficult. Without support material this model can simply not be printed in FDM without compromising on quality and accuracy. In this case - despite the added cost and print time - the additional support material used is essential to being able to complete the print. 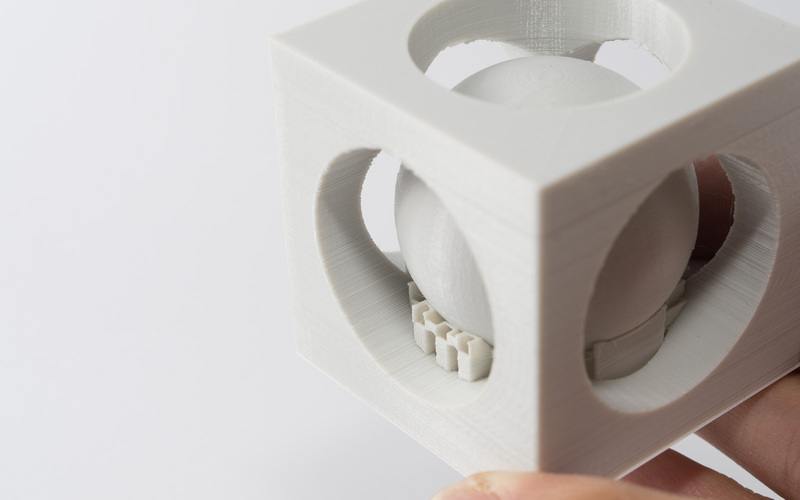 Close up of “Ball in a Cube” print showing the support structure needed. 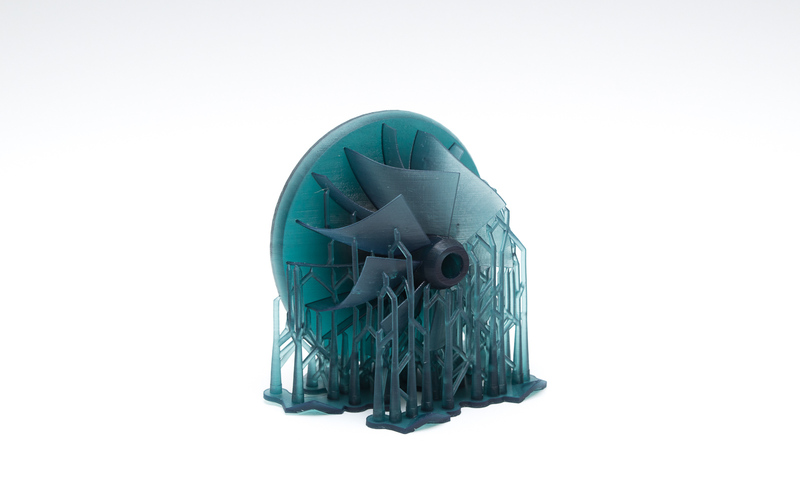 The first, a sort of flat accordion, or lattice, is the most common and is best suited for most FDM prints. The other type is a 'tree-like' support and is preferred by some printers. This method of support is less popular, however it has less contact with the print surface which can result in a better surface finish post processing. The printer operator will generally specify the type of support that best suits your application and thus minimizes the aesthetic impact on your design. Two different types of support structures: Accordion support (left) and tree support (right). 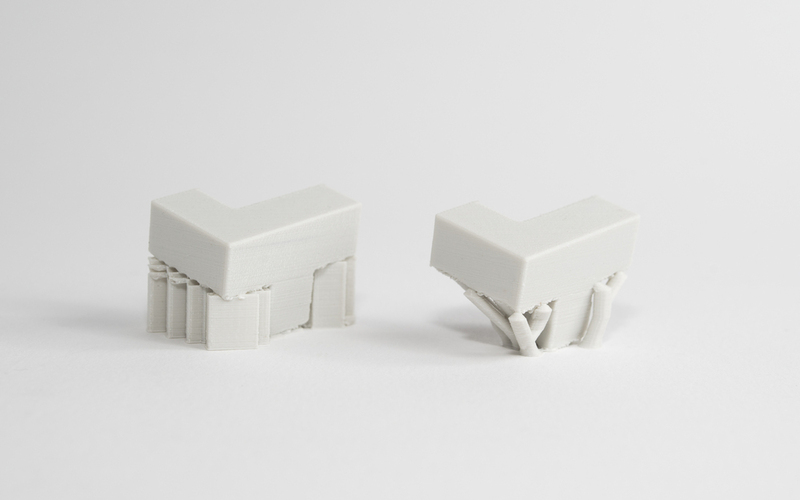 On finely tuned printers with two print heads, the support material can be printed with a dissolvable material that does not tear away from the part but instead dissolves away in a chemical solution that does not affect the main material of the printed model. 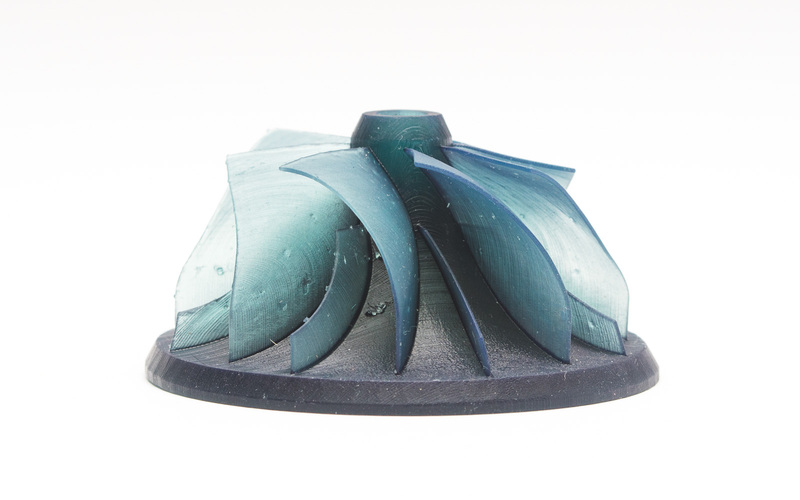 This will result in a better surface finish where the support is in contact with the main material but can be an expensive and a time-consuming solution. An example of this is the Ultimaker 3 machine, which utilizes support printed in PVA that is easily dissolved post print. All industrial FDM machines use disolvable support. Stereolithography (SLA) and Digital Light Processing (DLP) create 3D printed objects from a liquid (photopolymer) resin by using a light source to solidify the liquid material. Depending on the exact printer type, this means that the model is either pulled out of a vat containing liquid material as it is solidified by a light source through a translucent window at the bottom (bottom-up), or it is submerged into the liquid as the top layer is treated by a light source from the top (top-down). When is support needed in SLA & DLP? To make sure that the prints adhere to the print platform and do not float around in the vat, SLA and DLP printers require the use of supports in almost all cases. Support structures from these printers look like thin ribs, with only small tips actually touching the model to save material and printing time. The number of supports, their location, where they touch the model and the structure is calculated by the software and is dependent on the shape, orientation and weight of the part being printed. 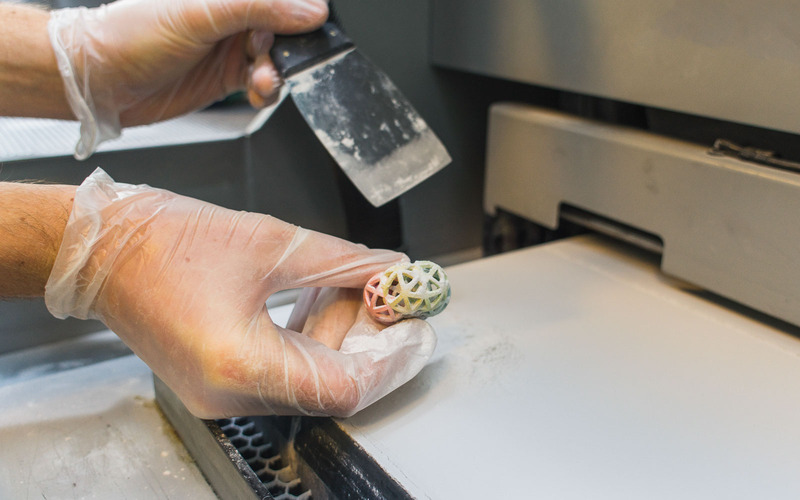 SLA and DLP are some of the most accurate technologies, capable of printing even the smallest and most intricate objects with accurate detail. With proper post-processing, the usage of supports does not impact the quality of the print. First, Isopropyl Alcohol (IPA) is used to wash liquid resin off your completed parts. Support structures can be either broken off the surface of the model or removed using pliers. The spots where the support was in contact with the object are then sanded to remove any remaining marks. Part orientation plays a crucial role on where support is located for SLA and DLP printing. 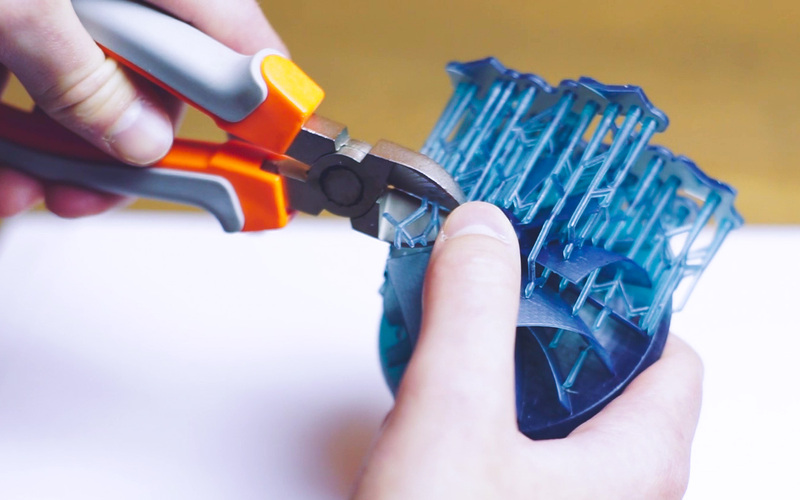 By reorienting a part, the amount of support (and therefore the cost of the print) can be drastically reduced. Orientation also plays an important role in where support will be located. If the aesthetic appearance of a surface on a component is paramount, orientating the part so that there is little to no support in contact with that area can also be an option. For complex prints with a high amount of detail and many thin or intricate features dividing up the print into separate sections and then assembling them together (via snap-fit connections, interlocking parts or adhesives) can also improve print quality and appearance. Curious about the cost and the available material options of SLA/DLP? Material Jetting (Stratasys PolyJet and 3D Systems MultiJet Modeling) technologies are similar to inkjet printing, but instead of jetting drops of ink onto paper, these 3D printers jet layers of liquid photopolymer onto a build tray and cure them instantly using UV light. When is support needed in Material Jetting? These printers require the use of support material in all cases where there are overhanging parts, regardless of the angle. Supports are either water-soluble or are removed during post-processing using plyers, water jetting, ultrasonic bath and sandblasting. Unlike FDM, supports for these technologies are in no way detrimental to the looks, surface quality or technical properties of the prints. After proper post-processing, it’s practically impossible to distinguish parts that were covered with support from the rest of the print. Due to the power tools (waterjet, sandblaster) used during-post processing, intricate parts of the model might get damaged or bent. Make sure to follow Material Jetting rules to avoid any issues. If your model has intricate parts and thin wires, SLS printing is recommended instead. Selective Laser Sintering (SLS) fuses powdered material in a chamber using a laser. 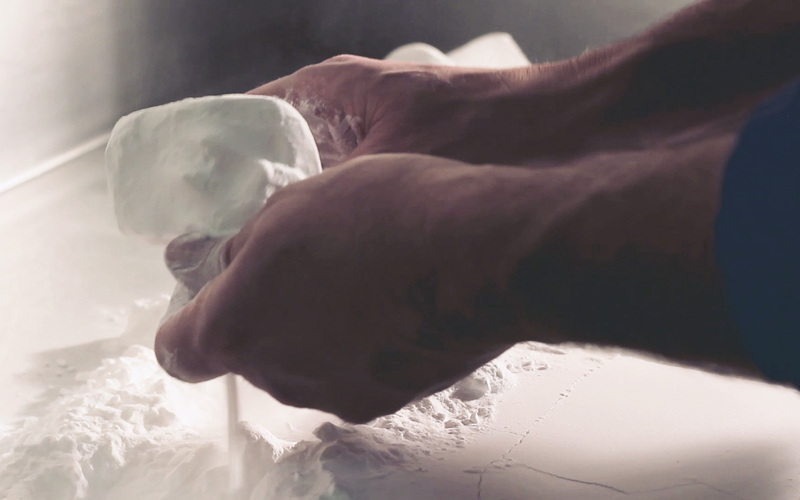 For SLS there’s no need for support structures since the powder acts as support when the object is built up layer by layer. This gives a lot of design freedom but also generally increases the cost and time to print a part. SLS requires time for the build chamber to cool down and cleaning the print requires a multi-step finishing process, including removing unfused powder, typically with an air gun. When printing with SLS, the unfused powder around the print functions as natural support that is easy to remove. Binder jetting is similar to SLS in the way that the printer uses thin layers of powdered material to build up an object, but instead of using a laser that sinters the layer together, these printers use a binding agent extruded from a nozzle to bind the powder together. 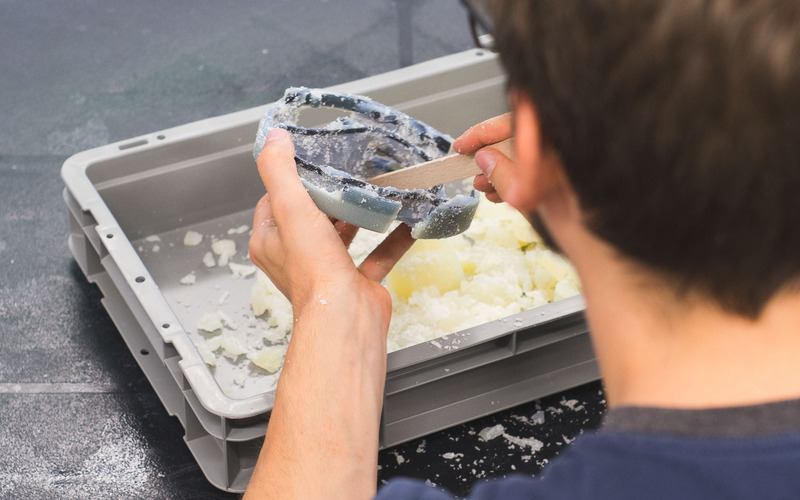 Just as with SLS, there’s no need for support structures since the powder acts as support when the object is built, but cleaning and post processing the print requires a multi-step finishing process, including removing unfused powder, typically with an air gun. Curious about the cost and available material options for Binder Jetting? Unfused powder is removed from a binder jetted print. Metal printing technologies use support structures to keep models fixed to a base plate during the building process in all cases, but overhangs with an angle greater than 35 degrees can be built without support. When supports are needed, it’s important to make sure that they are easy to access or else they cannot be removed during post-processing. The usage of supports does not impact the quality of the print in any way, and with proper post processing, all marks can be removed from the printed model. Curious about the cost and available material options for Metal 3D printing? Metal prints - still attached to the printbed - showing support structures. Support will generally have a detrimental impact on the appearance of a part (with the exception of Material Jetting). 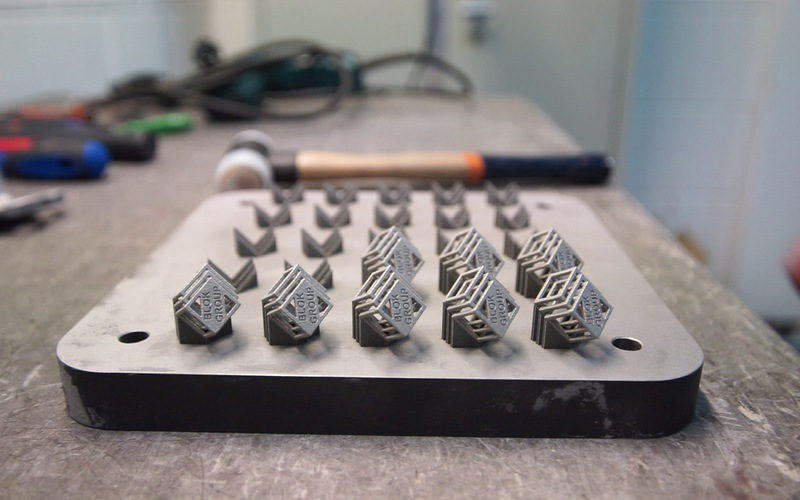 Post-processing is generally required to improve surface finish after support removal. The more support that is added, the more complex a design can be. The amount of support used can be optimized (part orientation, required level of accuracy etc) to lower cost and print time.